This image in our series of Ireland pictures from Achill Island shows Keem Bay viewed from sea level close to Carrick Mor. To the left of Keem Bay is Moyteoge Head, with its disused watch tower just visible as a sharp point some 198m above sea level. 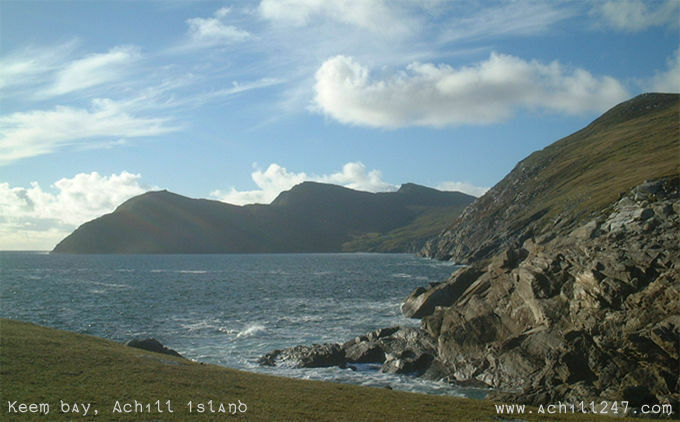 The west-facing cliffs reaching back from Moyteoge provide a breathtaking hill-top walk right back to Achill Head. Keem Bay was once home to the estate of the infamous landlord Captain Charles Cunningham Boycott, though he later moved to Corrymore House on Achill when his Keem house burned down.